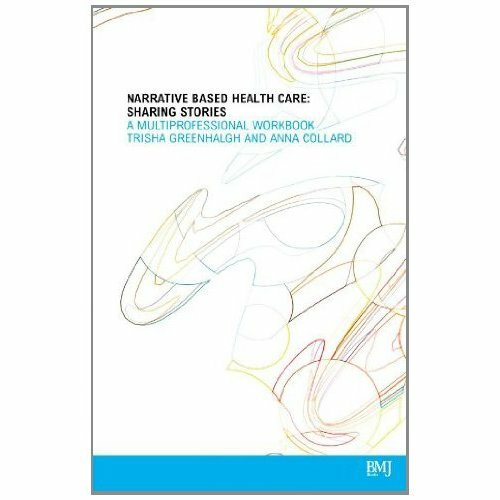 Searching around Amazon to find out what’s been published on Medical Rhetoric, I came across this 2003, London-based study/workbook that aims to provide healthcare professionals with a model for investigating the needs of the patients in order to improve their services: Narrative Based Healthcare:Sharing Stories–A Multiprofessional Workbook. The book shows how collecting ethnographic-like qualitative data about Diabetes patients with a particular condition can be translated into meeting the needs of patients who, ordinarily, in a clinical setting, are not able to communicate those needs to health professionals. I haven’t read the book, but I’m going to find a copy; it provides specific assignments, templates, and further reading, so I’m considering looking at it as an example of qualitative research in Medical Rhetoric/Communications. The publisher, BMJ Books, produces medical text books in primary care and evidence based medicine (EBM). The first author, Trisha Greenhalgh, has written many books on these two topics as well as technical writing types of text books such as How to Read a Paper, a bestselling EBM textbook worldwide. This entry was posted in ENC 6720 Qualitiative Methods, Medical Rhetoric and tagged "Learning", Ethnography, Evidence Based Medicine, healthcare, medicine, Qualitiative Research, Research Methods, The Rhetorical Turn, Trisha Greenhalgh.